When will we see the first swarm? The reason I started these news posts was to improve communication between KSBA and Kentucky’s beekeepers. However, communication is a two-way street. It’s not just us providing you with information. So let’s start sharing information and getting to know each other a little better. One way I think we can accomplish this is through a short, monthly survey. Each survey will be completely anonymous. No identifying information will be collected, not even an email address. Every month I’ll post a new survey. The next month, I’ll compile the survey answers, share them with everyone, and post the next survey. Many of the beekeepers I know (myself included) are wondering if our warmer-than-normal winter will result in early swarms. I thought that would be a good topic for our first survey. Mark the week in which you see or hear about the first swarm this year. Also, let us know what county it was in so we can track the first swarms as they move across the state. Only report the first swarm you see in each county. 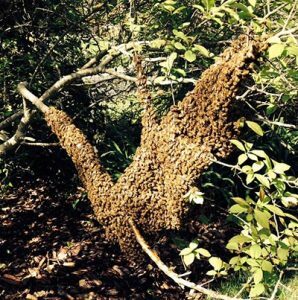 In other words, if you see or hear about your first swarm in one county one week and then you find out about another swarm in a neighboring county the next week, you can do the survey twice – once for each county as long as that was your first swarm for each county. Don’t worry about whether someone else may have already reported an earlier swarm in that county. I can easily filter through all that on the back end of the survey. P.S. If you can’t see the survey below, you can also access it at this link: https://www.surveymonkey.com/r/JD78XG3.